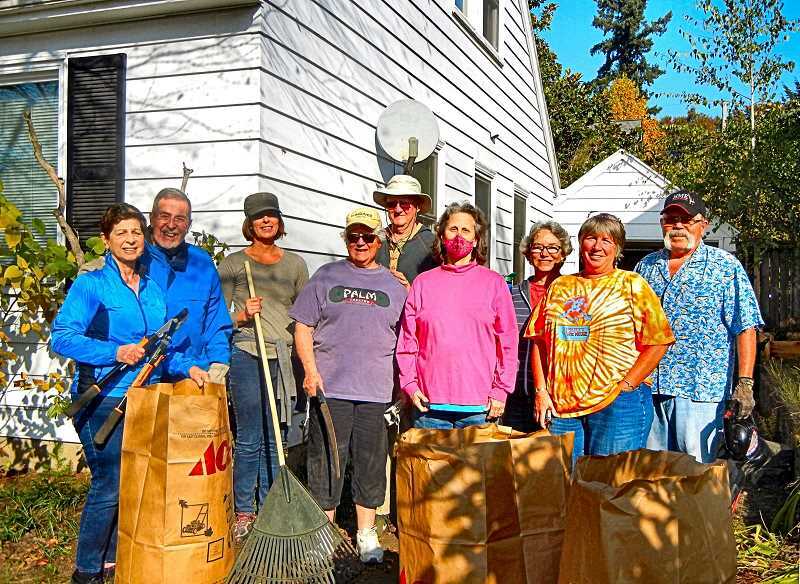 On a recent sunny Sunday fall morning in Eastmoreland, eight people affiliated with nonprofit "Eastside Village" helped homeowner Saida Kupel with the yard work she is no longer capable of doing. "I have incurable cancer and I'm living alone. I've always been really independent, but now I'm needing a lot more help." Kupel has only been a member of Eastside Village – not exactly a village, but an organization that helps people in Southeast Portland "age in place" – since early September. She says when a Village volunteer came to her home to assess her situation the volunteer remarked diplomatically, "I see your front yard needs some tender loving care." One of the volunteers on hand that day to help rake fall leaves and sweep Kupel's driveway was Anne-Marie Dallaire, who just moved with her husband Lucien from Connecticut in August, to be closer to their sons in Portland and Seattle. They are now living in the Woodstock neighborhood, where they can happily "walk to everything", as she says. Asked how they found out about Eastside Village, Anne-Marie said, "We had friends move from Connecticut to California and they had joined a 'village'. They said to check and see if there was one in Portland. "We found Eastside Village and we already feel like we know all of these people," Anne-Marie commented, referring to all of the Eastside Village members they have met through the social outings and volunteer work. Woodstock resident Jin Darney, who is part-time office manager of Eastside Village, has been a member since the organization began in 2015. She says, "It is fun to get together and work on a project [with other Village people]. We have a once-a-month slot for work parties." Darney's husband Craig Johnson reported that in 2015 two villages had merged to form Eastside Village. He volunteers most often as a driver, making it possible for people like Kupel to get to doctor's appointments. "I also help in work parties every so often," he added. "We can do a lot in a couple of hours with a big-enough crew." Autumn Carroll is not a member of Eastside Village, but volunteers for it because in her home health care work she saw a need. "I thought, 'I could help with that'." There are two types of membership for Eastside Village. One is primarily just to join in its social activities; and the other is full-membership, which makes it possible to receive help from village volunteers. "We can even go to members' homes to help replace a ceiling light bulb, or a smoke detector battery," related Anne-Marie. Volunteers do a variety of tasks to help people continue to live in their homes.